As World Council of Churches leaders looked on, including United Methodist Bishop Mary Ann Swenson, Pope Francis spoke June 21 about the significance of Catholic involvement in ecumenical work and pledged its commitment to the cause of Christian unity. 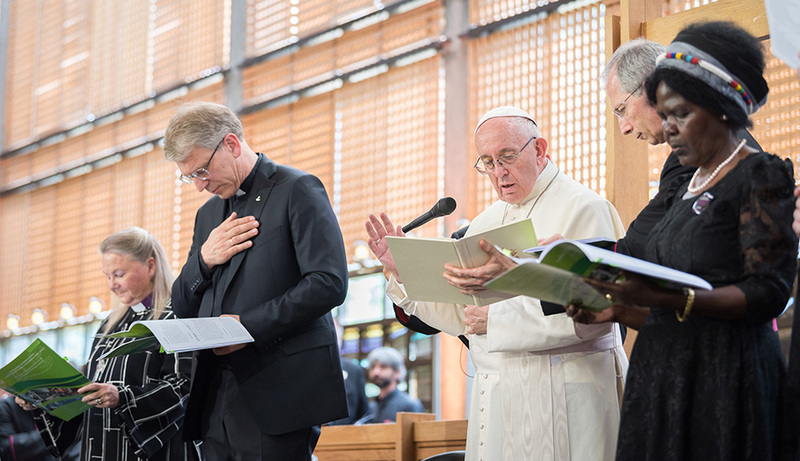 The occasion was the pope’s visit to the WCC Ecumenical Centre in Geneva, considered a centerpiece of the commemoration of the council’s 70th anniversary. The visit included a morning prayer service, a lunch with council leaders, and an afternoon session with the council’s Central Committee and a public mass. Swenson, who serves as the Central Committee’s co-vice moderator, was part of the top leadership group greeting and escorting the pontiff around the council’s headquarters. The pope noted his desire to take part in the 70th anniversary celebrations as he spoke about moving towards Christian unity. He also affirmed the commitment of the Catholic Church to that cause. Reflecting on the day’s theme, “Walking, Praying and Working Together,” the pope pointed out that all were ways of moving forward as one. Pope Francis gives the blessing during an ecumenical prayer service with religious leaders from all over the world. Attending the World Council of Churches service (from left in the font row) Bishop Mary Ann Swenson, the Rev. Dr Olav Fykse Tveit, Pope Francis, Agnes Aubom. Photo by Albin Hillert, WCC. In his address to the central committee, Pope Francis called for a “new evangelical outreach” and said he was convinced “that an increased missionary impulse will lead us to greater unity. In her remarks, Agnes Abuom — an Anglican from Kenya who serves as the central committee moderator — pointed out some of the “many concrete situations” in which the council and Catholic Church work together. “Let me just highlight how important it is that Christian churches look at each other as one, in South Sudan, how critical joint action for justice and peace is for the peace process in Colombia; how powerful it is to pray and work together for the reunification process in the Korean Peninsula; how much a concerted action is needed in Burundi and the Democratic Republic of Congo,” she said. Pope Francis shook hands with members of a delegation of Christians from North and South Korea, whose presence throughout the central committee meeting provided input for an important agenda item — justice and peace on the Korean peninsula. The Korean Christians demonstrated their quest for unity during celebrations marking the council’s 70th anniversary, linking arms to sing the 600-year-old folk song that is the unofficial anthem of Korea. 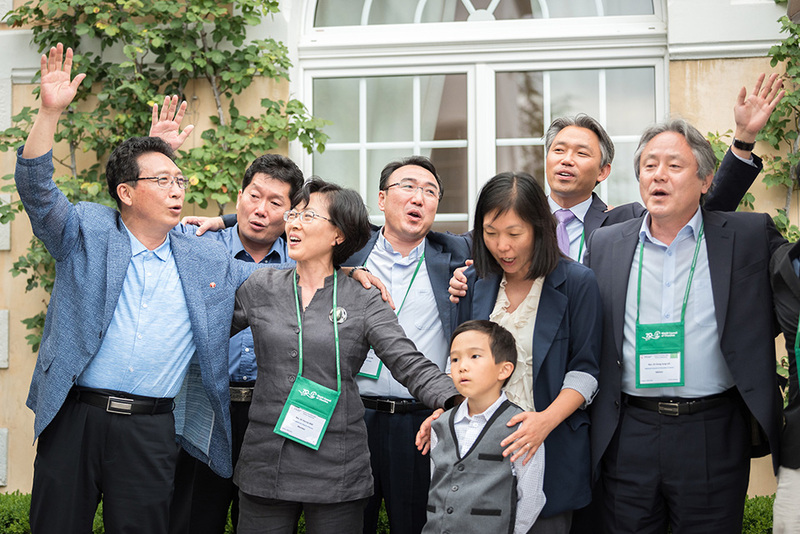 Koreans from both North and South Korea and American Koreans join together in singing a 600- year-old Korean folk song, “Arirang,” about love and reuniting during events of the World Council of Churches. Photo by Albin Hillert, WCC..
United Methodist Bishop Hee-Soo Jung, who leads the Wisconsin Episcopal Area, said the visit of Pope Francis to the WCC on the organization’s 70th anniversary encouraged and ignited great hope for the Korean delegation and those who pray for peace, reconciliation and healing on the Korean peninsula. “I was so moved and felt a strong responsibility as I saw Pope Francis blessing the Korean delegation from South and North Koreas before the ecumenical address,” said Jung, who was born and raised in Kwang Hwa Do in South Korea, which is near the border between two Koreas. “I believe it is a God-given opportunity for reconciliation and peace. I think the Korean Peninsula is the prayer and common goal of all people of faith in the world,” Jung said. In a presentation to the central committee on June 20, the Rev. Myong Chol Kang, chairman of Korean Christian Federation, Democratic People’s Republic of Korea (North Korea), expressed optimism following the U.S.-North Korea summit on June 12. “The adoptions of the Panmunjom Declaration and the Joint Agreement are intended to realize love and reconciliation among the Korean people and to realize the peace and security of the Korean Peninsula and the world, and we believe that it is worthy of the Lord’s will of love and justice,” he said. “Believing in no other way than peace, we … desperately implore you to maintain your compassionate eucharistic solidarity by accompanying us further until the time we successfully break the chain of the cold war-division system,” he added. A new statement on Korea adopted by the central committee called the summit “an important first step” and encouraged continued and even accelerated WCC-initiated visits and exchanges.